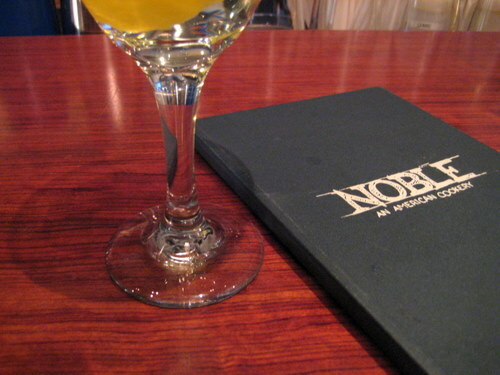 I hadn’t planned on eating at Noble at all. The plan was just to have a drink after a concert. But then the concert got cancelled. And even though I had eaten before the concert, my stomach felt like I hadn’t eaten at all. Where did my dinner go? So that’s how we ended up eating at Noble. Not a full dinner, but some snacks, because the strong drinks needed some food to soak into! I know there’s been some drama here lately… as the original executive chef / co-owner left in october and they recently announced who the replacement was. I never had a chance to eat with the original chef, and I’m not sure if the menu has been completely changed or not. It was V day, so the regular dinner menu was not available, but we were able to order a few bites from the bar menu. 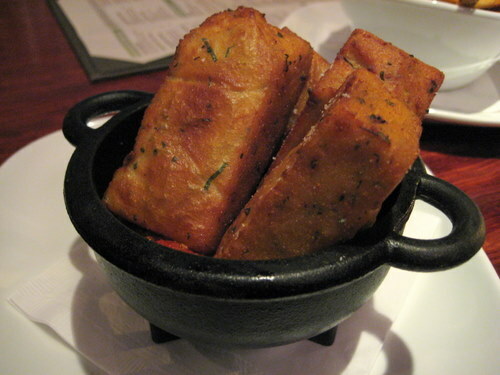 I asked about the chickpea fries and our fantastic bartender recommended them wholeheartedly. Called panisse in france, it’s basically chickpea flour mixed with water and shaped into a cake, and then sliced and deep fried. While the outside is slightly crispy, the inside is smooth and custard like. It was served with a marinara type sauce, and it was delicious! It’s one of the coolest and best new things I’ve tasted. 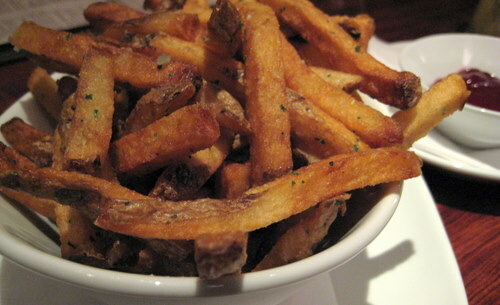 We also got some french fries, because really, who doesn’t like deep fried slices of potatoes? These were quite good. But they were made even better by the house made ketchup. Do you see the color of this ketchup? It’s not red. It’s more of a burgundy color. And can you guess why? When I started eating these fries, I smelled a distinct smell that can’t be anything else but this secret ingredient. I couldn’t put my finger on it at first, and then after a few more bites, I had it. Beets. BEETS! There are beets in this ketchup! Which easily explains the beautiful hue. And what do I think of beet ketchup? Damn, I could put this on everything. This kicks heinz out of the damn water. We were watching our bar neighbors mowing down on the V day prix fixe, and it certainly looked scrumptious! If these little bar bite teasers are any indication, I can’t wait to come back here for a proper meal. I do love fried things and those look so delicious. Beet ketchup, who’da thought… but that color is really beautiful. oh those chick pea thingies were delicious! 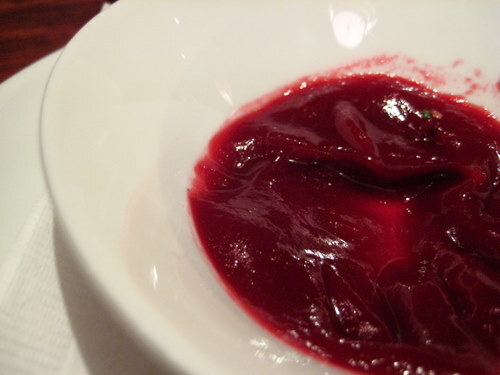 so smooth and creamy and not too much breading or anything… and the ketchup was really amazing… if you like beets, you would love it!